Describe the value that Event Monitoring Analytics offers your business. Explain how Event Monitoring Analytics lets you visualize key performance indicators and answer important questions about your users’ behavior. Identify the licenses you require to access Event Monitoring Analytics. You just received a call from your chief information officer (CIO), who wants you to start reporting weekly on report downloads, to spot trends, benchmark performance, and identify problems early. Oh, and did she mention that “reporting weekly” starts tomorrow? What are the top reports that have been downloaded in the last week? Are there report download trends we should be concerned about? Who has downloaded the most reports? Are there any reports that have performance problems? The Event Monitoring Analytics app makes it easy for you to base your actions on insights drawn from data. Event Monitoring Analytics pulls its data from Salesforce event logs. 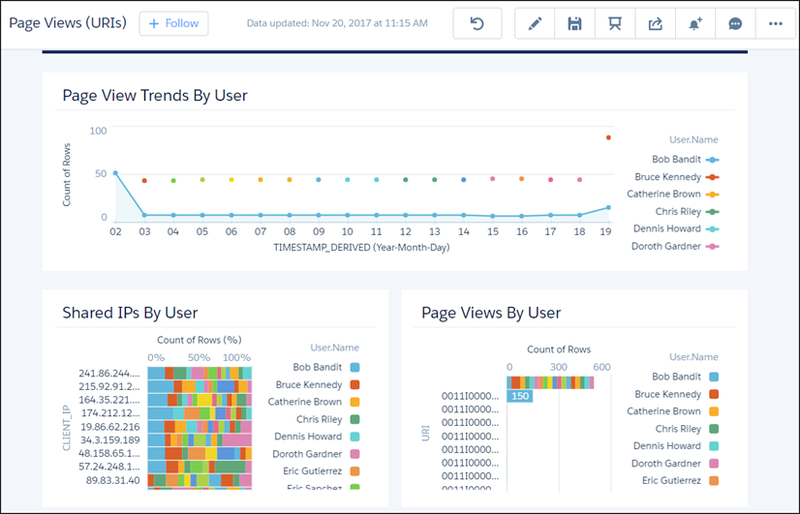 Event Monitoring Analytics provides dashboards for both you—the Salesforce admin—and your users. This app helps you drill into your org’s data and swiftly identify suspicious behavior, slow page performance, and poor user adoption. Salesforce has done a lot of the hard work: We’ve built complex queries and ratios that draw from your event log data and assemble the information into easy-to-read visualizations. You answer questions in a configuration wizard about the data you want to see and for how long, and Analytics takes care of the rest. After you schedule the daily dataflow and it runs successfully, you can get a workable set of dashboards when you create the app and then improve from there as needed. After the app is generated, use its prebuilt datasets and dashboards to explore Event Monitoring data from any device that supports the Analytics platform. The intuitive visual interface delivers key insights. Drill deeper into the areas you want to focus on, and set email notifications on KPIs right from the dashboards. DTC Electronics has already purchased the Event Monitoring tool, which includes 10 Event Monitoring Analytics App licenses. So all you need to do is set permissions, create the app, and get started. Event Monitoring is part of the Salesforce Shield platform. Salesforce Shield is a trio of security tools that admins and developers can use to build a new level of trust, transparency, compliance, and governance right into business-critical apps. In addition to Event Monitoring, Salesforce Shield includes Platform Encryption and Field Audit Trail. For this module, you can’t use an existing Developer Edition or Trailhead Playground org. 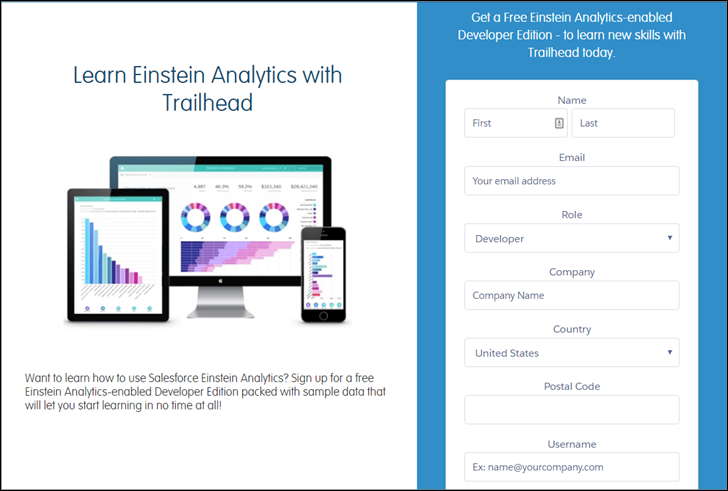 You must sign up for a new Analytics Developer Edition account, which comes with a limited version of the licenses for your app and contains sample data for this Trailhead module. Let’s get you set up so you can log in and start working with your app. Fill out the form using an active email address. Your username must also look like an email address and be unique, but it doesn’t need to be a valid email account. For example, your username can be yourname@analyticsrocks.de, or you can put in your company name. After you fill out the form, click Sign me up. A confirmation message appears. When you receive the activation email, open it and click the link. Complete your registration, and set your password and challenge question. Write down or remember your credentials. To log in and play, just go to login.salesforce.com. You’re now logged in to your new Analytics Developer Edition org. Way to go! You’re ready to create your Event Monitoring Analytics app. In the rest of this module, we work with you to create and use Event Monitoring Analytics. We do some hand-holding, but you probably don’t need much. Before jumping into the next unit where you create your own version of Event Monitoring Analytics, take a few minutes to work your way closer to your badge by answering the challenge questions.